We’d love your help. Let us know what’s wrong with this preview of Here Come the Girl Scouts! by Shana Corey. The amazing, all-true story of the first Girl Scouts and their visionary founder. Juliette Gordon Low--Daisy to her friends and family--was not like most girls of the Victorian era. She loved the outdoors, and she yearned for adventure! Born into a family of pathfinders and pioneers, she too wanted to make a difference in t The amazing, all-true story of the first Girl Scouts and their visionary founder. She loved the outdoors, and she yearned for adventure! Born into a family of pathfinders and pioneers, she too wanted to make a difference in the world--and nothing would stop her. To ask other readers questions about Here Come the Girl Scouts!, please sign up. Whats the point of it ? Kind of a funny book that's difficult for me to read objectively; my first reaction was to think it odd that so many things were left out, but if you didn't know about those things, well, it wouldn't matter, right? But I was surprised that the book quickly skips over all the well-known (so to speak) engaging adventures of JGL's childhood and plops her right into middle-age, not mentioning her marriage at all. Since the book skipped all that good stuff, I would have liked it better if this had be Kind of a funny book that's difficult for me to read objectively; my first reaction was to think it odd that so many things were left out, but if you didn't know about those things, well, it wouldn't matter, right? But I was surprised that the book quickly skips over all the well-known (so to speak) engaging adventures of JGL's childhood and plops her right into middle-age, not mentioning her marriage at all. Since the book skipped all that good stuff, I would have liked it better if this had been presented as the story of early Girl Scouts--which is really what it is--rather than a biography of Juliette Gordon Low, which it really isn't. A magical biography about the founder of the Girl Scouts. I spent most of my childhood first as a Brownie to then as a Girl Scout and then becoming a Scout camp counselor. What wonderfully fond memories. A lovely picture book, beautifully detailed, about the life of Daisy Low, founder of the Girl Scouts in America. She seems like a very fun, interesting, intelligent, inspiring individual unafraid to say to heck with tradition and chart her own territory. And how wonderful that she chose to chart a course that many girls could follow in the future, filled with fun and good values. The story here could be read to younger kids in the middle of the picture book years, but I do wonder if you'd have t A lovely picture book, beautifully detailed, about the life of Daisy Low, founder of the Girl Scouts in America. She seems like a very fun, interesting, intelligent, inspiring individual unafraid to say to heck with tradition and chart her own territory. And how wonderful that she chose to chart a course that many girls could follow in the future, filled with fun and good values. The story here could be read to younger kids in the middle of the picture book years, but I do wonder if you'd have to skip reading the quotes that are interspersed with the illustrations--much as I love them, it broke up the narrative flow a bit and I think would pose a challenge for read-aloud, but I'm not sure. Older kids would probably enjoy reading this on their own and appreciate more of the history included in the back matter. Absolutely loved this beautiful book. Loved the rich quotes mingled throughout the book in addition to the story itself. What a person of inspiration! Perfect for numerous units throughout my school plus will be fun read-aloud for students to enjoy. Oh my goodness, I'm a little verklempt. This week boxes of Girl Scout cookies were delivered to my library media center by my students. I can not remember a time when I have not either been selling or buying Girl Scout cookies. When I was growing up it was not a question of whether you would join Girl Scouts but when; we were all in scouting. My troop leaders, Mrs. Williams and Mrs. Archer, were dynamos. Growing up in the 1960s there was a plethora of things girls were expected to know but our leaders took us above and beyond those ski This week boxes of Girl Scout cookies were delivered to my library media center by my students. I can not remember a time when I have not either been selling or buying Girl Scout cookies. When I was growing up it was not a question of whether you would join Girl Scouts but when; we were all in scouting. My troop leaders, Mrs. Williams and Mrs. Archer, were dynamos. Growing up in the 1960s there was a plethora of things girls were expected to know but our leaders took us above and beyond those skills; putting us out in the woods to survive armed with knowledge. I credit these two fine women and Girl Scouting with my ability to be resilient in the face of insurmountable odds. In a word...gumption. Here Come the Girl Scouts! : The Amazing All-true Story of Juliette "Daisy" Gordon Low and Her Great Adventure (Scholastic Press) by Shana Corey, illustrated by Hadley Hooper, is more than a picture book biography. Illuminating the life of a woman responsible for directing the course of girl's and young women's visions, hopes, for decades, it offers readers insights into the power of one. Whether she knew it or not, Juliette "Daisy" Gordon Low lived this quote. Here Come the Girl Scouts! is a nominee for the 2013-2014 South Carolina Picture Book Award. 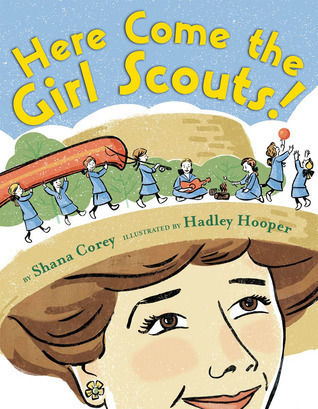 Here Come the Girl Scouts!, written by Shana Corey and illustrated by Hadley Hooper, is sure to be an inspiration to all girls (no matter their ages). Juliette "Daisy" Gordon Low didn't let anything stop her from achieving her goals, and that is a lesson that all readers, girls and boys alike, should learn. From traveling the world, to fishing at a fancy dinner party, to starting the Girl Scouts, Juliette Here Come the Girl Scouts! is a nominee for the 2013-2014 South Carolina Picture Book Award. 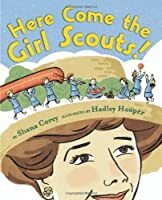 Here Come the Girl Scouts!, written by Shana Corey and illustrated by Hadley Hooper, is sure to be an inspiration to all girls (no matter their ages). Juliette "Daisy" Gordon Low didn't let anything stop her from achieving her goals, and that is a lesson that all readers, girls and boys alike, should learn. From traveling the world, to fishing at a fancy dinner party, to starting the Girl Scouts, Juliette Gordon Low is a figure to be admired, and it is my hope that many young readers will take the message of this book and truly make it their own. Peppered with quotes from the Girl Scouts guide, Here Come the Girl Scouts! tells readers all about Low and the founding of the Girl Scouts. The book emphasizes the importance of helping others, protecting the environment, being strong females, and looking past differences. At a time when both feminism and conservation were considered controversial, Juliette Gordon Low was truly visionary, and we can all look to her for an example of how we should live our lives...by not being afraid to go after our dreams. This lighthearted look at the woman who was responsible for establishing Girl Scouts in the United States in 1912 imparts a lot of information without a lot of text. Starting with Juliette Low's childhood, it describes how she always had a personality that didn't take no for an answer. She was not afraid to question social mores, and this stood her in good stead when, at the age of 51, she met the founder of the Boy Scouts, Sir Robert Baden-Powell, and decided that she would bring the idea of his sister Agnes's Girl Guides back to the United States. In spite of the fact that not everyone agreed that girls should be as active as she envisioned, she quickly established a culture of physical fitness, service within the community, and realizing potential. The predominant greens, browns, and blues of the playful illustrations are a nod to the Girl Scout colors and to the outdoor activities that Juliette Low encouraged. An afterword of several pages includes more detailed information on both Juliette Low and Girl Scouting, along with a list of websites and books for students who want to learn more. This was a cute picture book about Juliette Gordon Lowe, founder of my beloved Girl Scouts. Details are kept very simple but seemed to dwell way too much on the way girls and women in her day were expected to be dainty and ladylike. I would have liked to have seen more of the Girl Scouts in action and pages from the original handbook. Instead of just saying she had adventures, I would like to see more of her having them. This winning picture book details the life of Juliette "Daisy" Gordon Low and how she started the Girl Scouts in 1912. Having never been a Girl Scout myself, I learned a lot about the early days of the organization. Girl Scouts is a popular topic at my library and the books coming out about its start are a very welcome addition to our library collection! I love books that come together perfectly both in text and illustrations. This one does a great job on both levels. Lots of great information about the founder of the Girl Scouts and also the end notes provide lots more information. Can't wait to share this with our Daisy troop at school. Loved the illustrations, loved the sayings swirled throughout the text, and who wouldn't love a book that starts off with the word "gumption." A marvelous overview of the founding of the American Girl Scouts and founder, Juliette Gordon Low. I liked the quotes from the Girl Scout guide sprinkled throughout the book. Here Come the Girl Scouts! written by Shana Corey is very inspiring in different ways. It tells the whole story on how the Girl Scouts got their start. It told of how Daisy wanted to make a difference in the world, and through hard work and determination, she did. Each page has an inspirational phrase for the reader. An example of this is "the work of today is the history of tomorrow, and we are its makers." At the end of the story, there are pictures of celebrities who were Girl Scouts in real Here Come the Girl Scouts! written by Shana Corey is very inspiring in different ways. It tells the whole story on how the Girl Scouts got their start. It told of how Daisy wanted to make a difference in the world, and through hard work and determination, she did. Each page has an inspirational phrase for the reader. An example of this is "the work of today is the history of tomorrow, and we are its makers." At the end of the story, there are pictures of celebrities who were Girl Scouts in real life and also notes from the author about the book, and about the Girl Scouts themselves. The illustrations in this book are very colorful, and detailed. The drawings are all outlined in a thick black, and then filled in with color. The story is set in the early 1900s, and the illustrator does a great job of portraying the time period. "Here Come the Girl Scouts," is a great informational book. This book tells the true story of how the Girl Scouts came into existence and became the group of girls that we all know and love today. Girl Scouts was started by a woman named Juliette Gordon Law, but everyone called her Daisy. When Daisy was growing up, in Savannah, Georgia, it was expected of her to be "proper, dainty, and delicate." But Daisy wanted to be adventurous. As a woman, Daisy rode elephants in India, visited the Great Pyr "Here Come the Girl Scouts," is a great informational book. This book tells the true story of how the Girl Scouts came into existence and became the group of girls that we all know and love today. Girl Scouts was started by a woman named Juliette Gordon Law, but everyone called her Daisy. When Daisy was growing up, in Savannah, Georgia, it was expected of her to be "proper, dainty, and delicate." But Daisy wanted to be adventurous. As a woman, Daisy rode elephants in India, visited the Great Pyramid in Egypt, and flew a monoplane. However, Daisy wanted more out of her life. She wanted to be useful and make a difference in the world. While in England, Daisy discovered a group called the Boy Scouts. The Boy Scouts began as a way to help serve their country. They spent lots of time outdoors, running, camping, swimming and fishing. Daisy thought that this was such a great idea, and that it should exist in America too. On March 12, 1912, the Girl Scouts began. She taught girls the 10 Girl Scout Laws. Daisy organized troops in private schools, orphanages, churches, synagogues, factories, and shops. While some people despised the thought of the Girl Scouts, others were thrilled with it. The girls worked to earn badges, such as, Dairy Maid, Naturalist, Pioneer, and Swimmer. Daisy traveled giving speeches and raising money for the Girl Scouts. Soon there were troops all over the country. Daisy never forgot about her original troop in Savannah, and would often visit, and tell them about her adventures. This book is very inspiring in different ways. It tells the whole story on how the Girl Scouts got their start. It told of how Daisy wanted to make a difference in the world, and through hard work and determination, she did. Each page has an inspirational phrase for the reader. An example of this is "the work of today is the history of tomorrow, and we are its makers." At the end of the story, there are pictures of celebrities who were Girl Scouts in real life. Some of these women are Lucille Ball, Gloria Steinem, and Rita Dove. At the end of the book, there are notes from the author about the book, and about the Girl Scouts themselves. Here Come the Girl Scouts tells the story of how Girl Scouts was started in American over 100 years ago. Daisy was an adventurous girl who thought that being a delicate lady sounded boring. She wanted to travel and see the world. Daisy first discovered a group in England called Boy Scouts. These boys spent time outdoors camping, fishing, and swimming. There was a sister group called the Girl Guides. She thought that girls in America should have something like this. When she arrived home she invi Here Come the Girl Scouts tells the story of how Girl Scouts was started in American over 100 years ago. Daisy was an adventurous girl who thought that being a delicate lady sounded boring. She wanted to travel and see the world. Daisy first discovered a group in England called Boy Scouts. These boys spent time outdoors camping, fishing, and swimming. There was a sister group called the Girl Guides. She thought that girls in America should have something like this. When she arrived home she invited her cousin over immediately. So on March 12, 1912 Daisy began the biggest adventure yet. She had over 18 girls and told them about the adventures they were going to have together. Daisy divided the girls into two troops and then taught them the ten Girl Scout laws. Daisy designed uniforms for them to wear. Daisy organized different troops all over the place. Each thing the Girl Scouts did earned them a different badge for their uniform. Soon enough there was Girl Scouts throughout the entire country. While this book is an informational picture book of how the Girl Scouts of American got started it can also be considered a biography. At the end of the book it has two pages that are informational telling the reader more about the life of Daisy and her adventures. There is a lot more information in this section which could be used for older readers and or teachers who wants to teach a lesson on this topic or person. The informational pages include pictures which are black and white and give you an idea of what Daisy really looked like. On the pages in the book there is quotes that are placed on an object in the illustration or just at the top or bottom of the page. These quotes are cited in the back of the book as well. Summary: Daisy never would take no for an answer. She believed that woman could do anything and everything that a man could do even though she lived during a time when others did not think so. So, instead of sitting at home, she went on adventures learning how to do anything she wanted to- from forging a gate for her house to riding on elephants. Then, during one trip to England, Daisy learned about a group called Boy Scouts and she knew that she had to make something like this for the girls of America. This idea was the birth of girl scouts. What I Think: This is one of those books where the text and illustrations so perfectly complement each other that the book becomes a piece of art in itself. I love how Shana Corey and Hadley Hooper played off of each other throwing in colors in the text and quotes in the illustrations. As Jen stated above, it is a wonderful mentor text to discuss anaphora and sentence variation as well as a great introduction to primary sources. It can also start a discussion of layouts and colors. This picture book biography of Juliette Gordon Low - known as "Daisy" - is a good, basic summary of the life of the woman who founded the Girl Scouts. The information in it is good, but the layout and illustrations are really its strengths. On each two-page spread is a quote from Daisy (usually from the guide she wrote for the Girl Scouts) offering some sort of advice or inspiration to girls. The illustrations are beautiful and clever while also fitting the tone and time period of the text perfe This picture book biography of Juliette Gordon Low - known as "Daisy" - is a good, basic summary of the life of the woman who founded the Girl Scouts. The information in it is good, but the layout and illustrations are really its strengths. On each two-page spread is a quote from Daisy (usually from the guide she wrote for the Girl Scouts) offering some sort of advice or inspiration to girls. The illustrations are beautiful and clever while also fitting the tone and time period of the text perfectly. This is Hadley Hooper's first time illustrating a picture book, and I definitely am looking forward to seeing what else she does in the future. I also enjoyed reading more about Daisy in the back matter at the end of the book. However, this section also pointed out to me that the main text of the book left out some major information. For example, while the author mentions that Daisy lived in England, she doesn't mention that she lived there because she married an Englishman. There is no mention at all of Daisy being married, which suggested to me that she was single her whole life. Was the author afraid that mentioning that the founder of the Girl Scouts had been married would somehow imply that girls have to marry in order to accomplish anything? Perhaps the author had no ulterior motive in leaving out the fact that Daisy was married. It just seemed to me something that I would have liked to know had I been a child reading this book about a famous woman. Definitely more about the beginning of the Girl Scouts than it is about Juliette Gordon Low. If you're not a Girl Scout (as I am not), I'm not sure you will enjoy this much. I read another review that said the quotes throughout the book are from the Girl Scout Manual. As I am not a Girl Scout, I didn't know that, and couldn't appreciate that. Even if I am not a member of an organization or a fan of group/profession/etc., I can usually appreciate a good biography/story of a person. Again, to me t Definitely more about the beginning of the Girl Scouts than it is about Juliette Gordon Low. If you're not a Girl Scout (as I am not), I'm not sure you will enjoy this much. I read another review that said the quotes throughout the book are from the Girl Scout Manual. As I am not a Girl Scout, I didn't know that, and couldn't appreciate that. Even if I am not a member of an organization or a fan of group/profession/etc., I can usually appreciate a good biography/story of a person. Again, to me this felt more about the organization, which is maybe why it didn't seem to resonate with me. I also probably do not love this one, as I know for a fact Juliette Gordon Low was deaf. From my research and what I have been taught about her, her hearing got progressively worse. In this book, you would think that while she may have gone deaf at one point, her hearing completely came back. That's not true at all. (From what I have studied/learned.) Again, that does not seem relevant in the story I suppose, as it's focusing on the Girl Scouts, and not on her, but when the book advertises itself as "The Amazing All-true Story of Juliette "Daisy" Gordon Low and Her Great Adventure"... I do feel it's important to be accurate. And to focus on her. Corey, S., & Hooper, H. i. (2012). Here come the Girl Scouts!. Scholastic Press. Content/Scope: A book depicting the life of girl scout founder Juliette Low. This book describes her early life and how she came to found the girls scouts. The book also contains part of the original girl scouts handbook. Accuracy/Authority/Bias: This book comes with a recommendation level of core collection by the Children’s Corey, S., & Hooper, H. i. (2012). Here come the Girl Scouts!. Scholastic Press. Accuracy/Authority/Bias: This book comes with a recommendation level of core collection by the Children’s Core Collection data base. It is also published by Scholastics who is known for its educational books. Arrangement/Presentation: This book has 40 pages and includes both illustrations and text. Relation to other works: This would be a wonderful addition to the social sciences section of the library. There are currently no books on girls scouts, but our school does have many girls who are in girl scouts. Accessibility/Diversity: This book will be specific interest to little girls who are wanting to, or have already joined girl scouts. Professional Review: Cardon, D. (2012). Here Come the Girl Scouts! : The Amazing All-true Story of Juliette "Daisy" Gordon Low and Her Great Adventure. School Library Journal, 58(2), 101. This is a true story about the character Daisy (Juliette Gordon Low). It discusses her adventurous lifestyle that led to the creation of the Girl Scouts. Creating a leadership program around the world, that teaches women life skills while bettering the community. In this book, it is giving historically accurate information in a more engaging form. Additionally, the book is using academically appropriate vocabulary, while introducing new words. The book discusses various ways to improve the plan This is a true story about the character Daisy (Juliette Gordon Low). It discusses her adventurous lifestyle that led to the creation of the Girl Scouts. Creating a leadership program around the world, that teaches women life skills while bettering the community. In this book, it is giving historically accurate information in a more engaging form. Additionally, the book is using academically appropriate vocabulary, while introducing new words. The book discusses various ways to improve the planet and teaches morality. Juliette "Daisy" Gordon Low's biography by Shana Corey is a great children's book on the story of Daisy's starting of the Girl Scouts of America. I would say the story is a story appropriate for ages 6-8. The book ends in two full pages of further information for adult readers, teachers, or parents. I found this information to be especially helpful. I think this book would be an excellent addition to a possible social studies unit on citizenship or famous people of America. It could be used as a Juliette "Daisy" Gordon Low's biography by Shana Corey is a great children's book on the story of Daisy's starting of the Girl Scouts of America. I would say the story is a story appropriate for ages 6-8. The book ends in two full pages of further information for adult readers, teachers, or parents. I found this information to be especially helpful. I think this book would be an excellent addition to a possible social studies unit on citizenship or famous people of America. It could be used as a read-aloud or individual reading. I don't think I would use this book in my small groups, as I think a whole group would be able to discuss just fine. It wouldn't necessarily be bad for small groups though - I'm just not sure it's necessarily "meaty" reading. Lives in Brooklyn, NY with her husband.